I received an e-mail from the man who bought it. The car now resides in Australia! I thought you might like to know some more about the Buick Opel by Isuzu story that you featured a while back. The fact that I was the one who bought that exact car probably isn’t important, however the fact that I bought it, got it trucked to California, then shipped to Adelaide, Australia may be of some interest. The cars were sold here as the Holden Gemini. 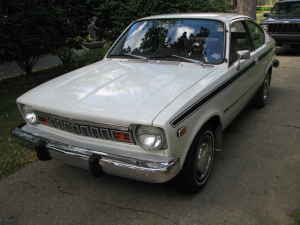 They were built by General Motors-Holden Ltd at their plant in Acacia Ridge, Queensland and were based off the Japanese-spec version of the GM ‘T’ world car, the Isuzu Gemini. The bumpers, exterior details and interiors were essentially the Japanese-spec items, however there were some minor differences. The Holden Gemini had a high level of local content; panels were manufactured in Australia along with the rear axles, radiators, seats and 3-speed Tri-matic Holden auto transmission, where fitted. The 1584cc G161 Isuzu motor was fully imported from Japan, while the MSG manual transmissions (4-speed and later 5-speed) were fully imported from the Phillipines. The Buick Opel by Isuzu, while visually similar, was entirely built in Japan and shipped over fully constructed to the USA. The bumpers and trim-levels were all US-specific (including those wild 5mph bumpers!) and engine was the 1817cc G180 Isuzu motor. I believe the 3-speed auto trans was manufactured by Jatco. Anyway, I was in the USA scouting for classic US metal to send back to Australia and being a long-term Isuzu enthusiast (I have a Holden Gemini, several Isuzu Belletts and an Isuzu Florian which is essentially the sedan version of the Chevrolet LUV) I couldn’t help myself on the Buick Opel by Isuzu. I spoke to Alan, the seller and he seemed like a genuine guy. He’d bought a Buick Opel by Isuzu sedan brand new back in the day and harboured the desire to have another one. He could not find a sedan but bought the coupe out of Fort Worth, Texas and had it shipped to Michigan. He’d used it sparingly since; the car still sported a Texas registration sticker! I explained to him that I was an Isuzu enthusiast; rare but true and not the local US kind that enthuse over the 80’s and 90’s FWD and AWD models. All my Isuzus are genuine, chrome bumper models plus my 1978 Holden Gemini van is essentially a panel van version of his coupe. After some negotiation we agreed on a price. I wired him the money and hoped for the best... and the best is what I got. In January 2011, our containers arrived with five, huge lumps of Detroit steel, a Datsun Fairlady and the Buick Opel by Isuzu. After a few months in storage and their long ocean voyage, the only cars that started first go straight out of the containers were the Japanese-built Fairlady and Buick Opel by Isuzu! Recently I debuted the car at Adelaide’s All Japan Day 2011. The car didn’t cause a very big stir; to the untrained eye it looked like any other Holden Gemini, but those that took the time to look at it and notice the 5mph bumpers or poke their head into the driver’s side only to see a passenger seat were well rewarded. Alan talked down the condition, which is excellent for an unrestored car of its age. Some polish, some bumper cleaner and a new thermostat later and it’s nigh-on perfect. Amazing story. The most surprising bit was that the Holden Gemini had Philippine-made transmissions. I didn't know they made transmissions there! I am so glad I came across your story. My first car was a 1978 Buick Opel. I bought it in 1982. I bought in in Savannah, GA and drove it numerous times to Atlantic City, NJ. I kept it for four years. I am sorry I got rid of it. That was a great car.